This is the motley bunch of men and boys that participated on the Father/Son campout this year. 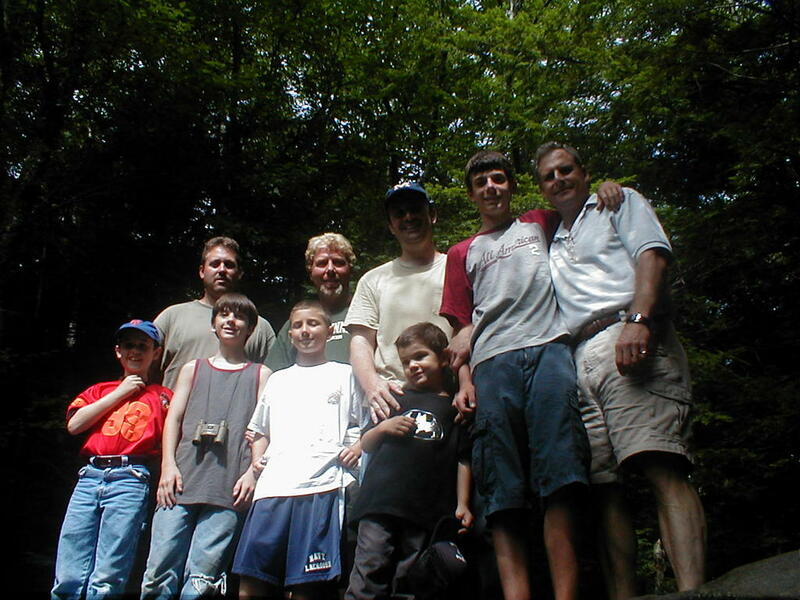 They go upstate to North South Lake in the Catskills and spend five days camping, hiking, fishing, swimming and praying. It is a retreat for the body and soul. The boys seem to love the “guy” time and the dads like being away with their sons. Ryan looks forward to it all year. Since Dave and the other dads are so busy with work and house stuff it is really important to make these opportunities to spend time individually with each child. Ryan, in particular, benefits from the time alone with his dad. He finds the world a less confusing place when his dad is around to guide him. He blossoms in his boyness and finds his inner tough guy. Between this campout and Maine Dave has made quite the fisherman out of Ryan and I think Dave is happy that Ryan is showing an interest in something he loves to do. Five days is a really long time (I think) to be away and we were all happy to have them home. I was surprised at how empty the house seemed with Ryan gone. I am used to Dave being gone but having one of the kids gone made a big difference around here. Nope I don’t like it. Bethpage Restoration Village. We kept pretty busy but it is nice to be back together again.